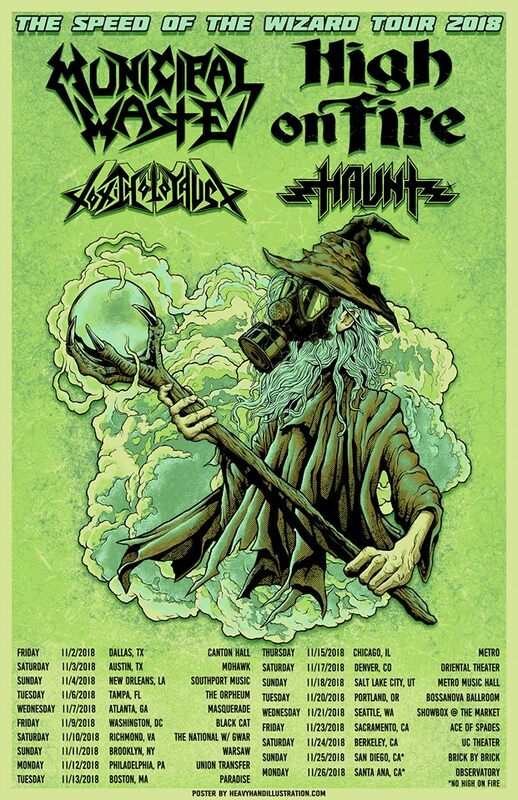 Municipal Waste Announces Co-headlining U.S. Tour with High On Fire! Municipal Waste will embark on a co-headlining U.S. trek with California heavy rockers, High On Fire. Direct support on "The Speed Of The Wizard Tour" will be none other than Portland thrash metallers Toxic Holocaust and Fresno’s Haunt. Tony Foresta checks in, "We’re really excited to be teaming up with our brothers in High on Fire to put together this sweet package of killer bands. We couldn’t be more pleased with how everything came together. Stoked to travel with our old friends and one of our favorite thrash bands Toxic Holocaust as well as getting blown away by Haunt every night. See you soon!!!"